The Edison Effect (1989-93) by Paul DeMarinis is a "series of sound sculptures that play antique Edison cylinder recordings with laser beams. The reflections of light from the walls of the cylinder’s grooves carry the audio information to a converter where it is translated into an electrical signal, then into music by a loudspeaker. First, however, in the element "Al and Mary Do the Waltz", the beam passes through a bowl of two goldfish, whose movements can interrupt the flow of information and the resulting sound. When not blocked by the fish, the resultant sounds range from recognizable to distorted, something like a distant shortwave radio or a haunting bit of a melody. 'The arrangement of optics, motors and light allow random access to the grooves of the records, permitting distortion, dis-arrangement and de-composition of the musical material,’ DeMarinis comments. One of many interpretations of the title is the drastic change in music that followed Edison’s invention of sound recording. It also refers to the discovery of thermionic emission (atoms from a glowing filament that cause the inside of a light bulb to darken), which led to the development of vacuum tubes and sound amplification. 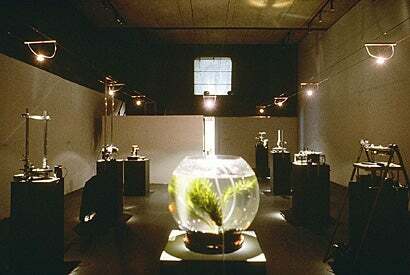 The work combines ancient and modern technologies, electronics and sound. The latter is a common combination in many of DeMarinis’s works: Music as a Second Language is a compact disc of speech processed by computers, and Grey Matter creates music through the communication of body and electricity."